Red Team Real Estate is hosting a free home buying workshop for first-time or second-chance homebuyers on Saturday, July 29, from 9:30 a.m. to 11 a.m. Saturday’s workshop will take place at 909 W. Magnolia Avenue, Suite 2, Fort Worth, TX 76104. Anyone interested in learning the ins and outs of the home buying process is encouraged to attend. The no-obligation workshop features industry professionals, Michael Mayes, Owner/Agent, Red Team Real Estate and Paul Duane, Mortgage Loan Originator, MiMutual Mortgage. Attendees have the opportunity to learn about all aspects of the home buying process, including the true picture of renting vs buying, budgeting, savings tips, credit repair, securing mortgage financing, working with a Realtor, homeowners insurance, property taxes, closing cost expectations, and loan programs aimed to assist new and experienced home buyers. Breakfast is provided for attendees by MiMutual Mortgage who will also be on hand to answer questions about available financing options including, FHA, Conventional, USDA, VA Loans, and more. For more information, visit www.RedTeamRealEstate.com or register online. You may also call or email Jennifer Wilson at jwilson@RedTeamDFW.com or 817.921.3545 with any questions. Red Team Real Estate is pleased to announce and welcome two new team members, Chuck Precopia and Jennifer Wilson. Chuck is the Broker for Red Team Real Estate. He brings 47 years of commercial and development experience to spearhead efforts in Red Team’s newly launched Commercial and Development Service offerings. Chuck has served in various commercial real estate and development positions at Zale Corporation, Greener & Sumner Architects, and Vice President of Corporate Properties for the Associates Corporation of North America. Upon leaving the corporate world in 1985, Chuck put his Broker’s license to use by heading up the Commercial Department of Century 21 McCracken Real Estate in Grand Prairie. Most recently he served as President and Broker at Client Based Properties, Inc. 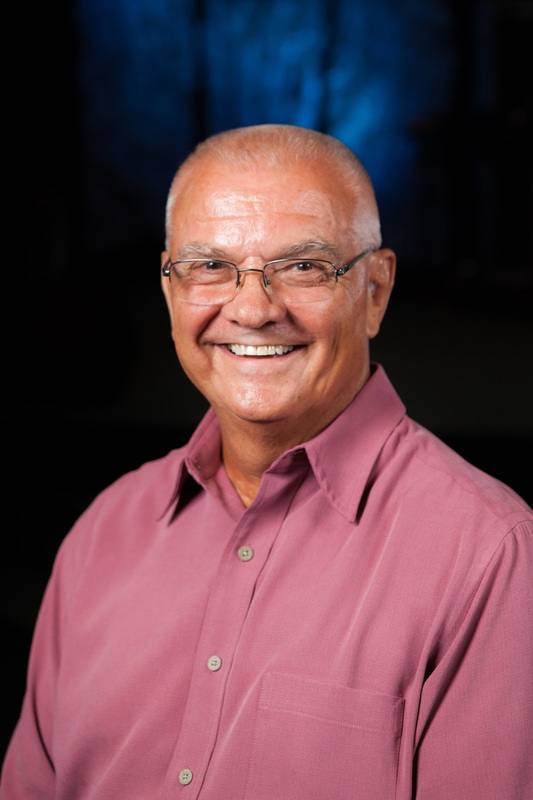 In addition to real estate brokerage, Chuck has worked in site surveying/platting, architectural design, construction, property management, and development. Jennifer joins Red Team as the company’s Marketing Director. Her primary focus is building Red Team’s brand and growing our involvement in the Fort Worth community. 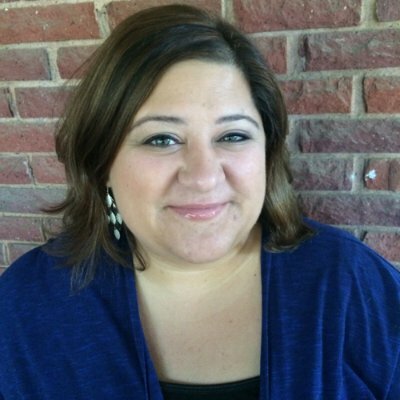 Jennifer comes to Red Team with over 15 years’ experience in marketing, relationship management, and communications in north Texas. She graduated from Texas Wesleyan University, where she earned a Bachelor of Science in advertising and public relations. “It’s such an exciting time at Red Team Real Estate! We are blessed to have two new team members of such high caliber. Adding Commercial and Development Services to our offerings allows us to tap into a market we’ve only spent limited time in up until now. The addition of Chuck Precopia and his wealth of experience gives us a unique edge on the Commercial Real Estate front in North Texas. Also, I know that as we grow, it’s important for Red Team to have consistent branding and messaging. Bringing Jennifer Wilson onto the team as Marketing Director will only strengthen the Red Team brand as we continue to expand our services. As our market share continues to grow, these changes make our Red Team Agents more successful and that helps the team win,” says Michael Mayes, Owner, Red Team Real Estate. Red Team Real Estate, established in 2012 and led by Michael Mayes, provides professional client-centric service by experienced agents dedicated to your needs. Located on the historic Magnolia Avenue in Fort Worth, our focus is on the best interest of our clients in each and every transaction, as we are dedicated to the development of long-term client relationships! 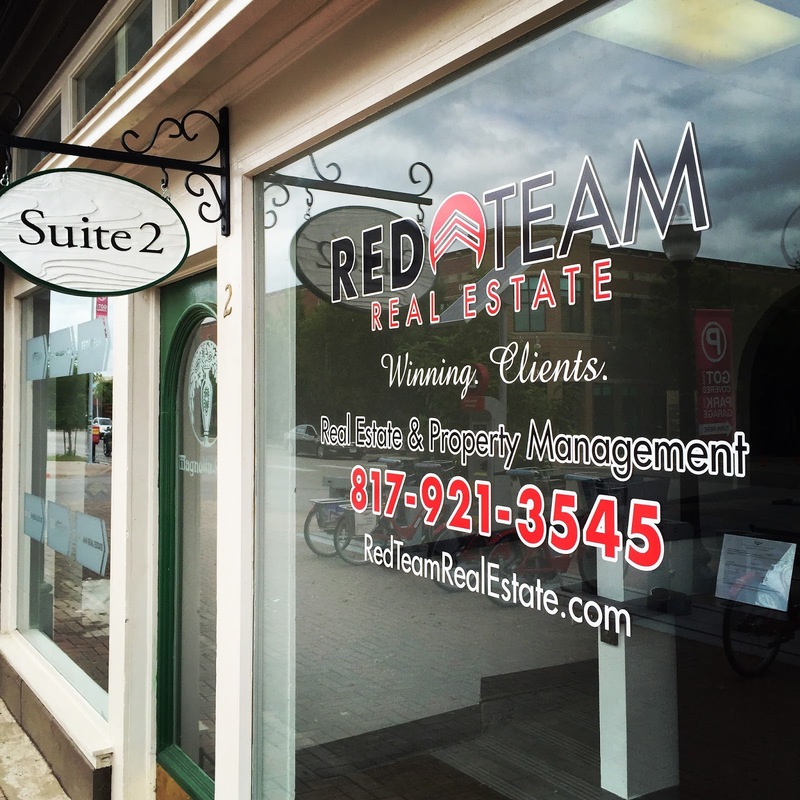 Let Red Team handle all of your residential and commercial sales, leasing services, and property management. Winning. Clients. 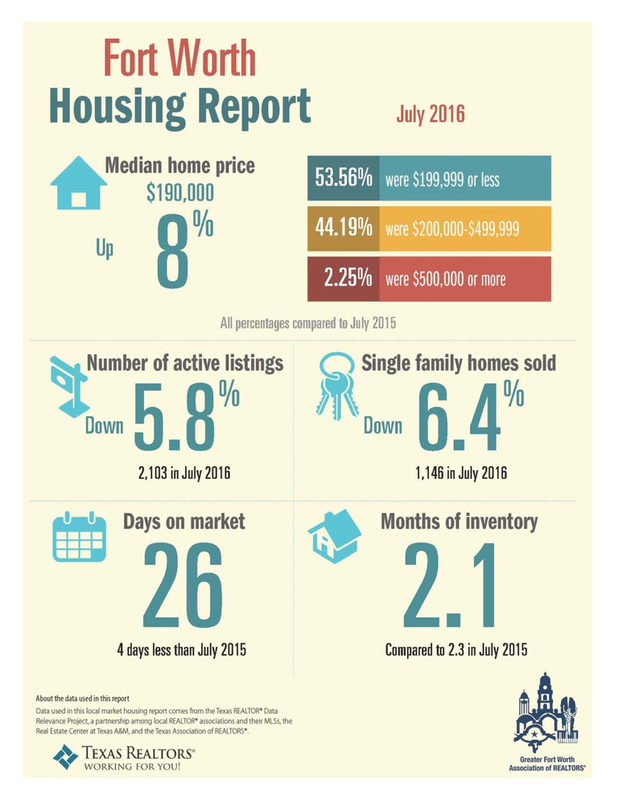 The Greater Fort Worth Association of Realtors recently released the July 2016 Fort Worth Housing Report, below. New Location. Same great service. to the almost 3,000 square feet of office space, we’ve grown in numbers to a seasoned team of 8 ready to serve all your real estate needs – residential, leasing services, property management, and commercial. We had a great turnout for our open house in early May. Many complimented our blending of the old and new. Unfortunately, Stella’s horse, Lady Blu, was unable to make an appearance (as you know, she’s got a busy horse schedule). The new digs have ample office, conference, and gathering spaces with beautiful views of downtown Fort Worth and Magnolia Avenue. We’re looking forward to neighborhood events where Red Team can stay involved. If you’re in the area, please drop in, it would be great to see you! Are you a current property owner who wants to ensure you’re getting the best return on your investment? In today’s market it only makes sense to have technology working for you. Any Property Management Company worth their weight in salt will be giving your properties the leverage they deserve by using technological tools that will nourish a successful investment. Collecting rent shouldn’t be a hassle. If you’re still going door-to-door, or only accepting cash and check payments, you’re doing too much work. Every Property Manager needs to invest in technology that will allow tenants to pay in whatever manner is convenient for them. And remember, the rent you receive must be reported on your taxes, and the right software will keep detailed records of all payments. This includes monthly owner statements, cash flow reports and other information that owners need to confirm your “Rental Business” is working. One of the latest and most effective tools for potential tenants and property managers to showcase their properties is online and through social media outlets. 87% of electronic device sales will be tablets and smartphones…which means property owners (or their managers) will need to accommodate this new generation of prospects and applicants with mobile online leasing tools. Investing in mobile online leasing tools allows potential tenants to do the whole application process online and saves you a heap of a paper mess! 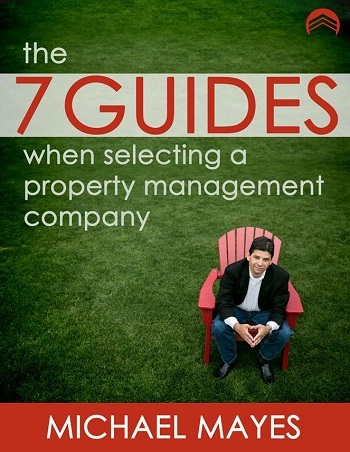 The 7 Guides When Selecting a Property Management Company, coming soon in 2016! Red Team Real Estate and Property Management was started in 2012 to focus on being the provider of quality service that has never been seen before in property management. Our approach is to serve our owners by providing professional, knowledgeable service with maximum value.